IFR Navigation: General Info Instrument Rating | Instrument Rating Lesson Plans | 7-day IFR Rating | IFR Adventure | Instrument Ground School | Safety Pilot | Holding | IFR Risk | Trip Reports | Flight Profiles | Rating Requirements | After the IFR Rating | Checkride Reviewer | Visi-Hold | Are you really ready? Here's the fatal scenario. . . . . . . The sky is overcast and the visibility is poor. That reported five mile visibility looks more like two, and you can't judge the height of the overcast. Your altimeter tells you that you are at 5500 feet but your map tells you that there's local terrain as high as 3200 feet. There might be a tower nearby because you're not sure how far off course you are so you press on. You find yourself unconsciously easing back just a bit on the controls to clear those towers. With no warning, you're in the soup. You peer so hard into the milky white mist that your eyes hurt. You fight the feelings in your stomach that tell you're banked left, then right! You try to swallow, only to find your mouth dry. Now you realize you should have waited for better weather. The appointment was important, but not all that important. Somewhere a voice is saying, "You've had it -- it's all over!" You've only referred to you instruments in the past and have never relied on them. You're sure that this is just a bad spot and you'll break out in a few minutes. The problem is that you don't have a few minutes left. You now have 178 seconds to live. Your aircraft "feels" on even keel but your compass turns slowly. You push a little rudder and add a little pressure on the controls to stop the turn but this feels unnatural and you return the controls to their original position. This feels better but now your compass is turning a little faster and your airspeed is increasing slightly. You scan your instruments for help but what you see looks somewhat unfamiliar. You are confused so you assume the instruments must be too. You are now experiencing full blown Spatial Disorientation. Up feels like down and left feels like right. You feel like you are straight and level again but you're not. The spiral continues. You now have 100 seconds to live. You glance at your altimeter and you are shocked to see it unwinding. You're already down to 3000 feet. Instinctively, you pull back on the controls but the altimeter still unwinds. You don't realize that you are in a graveyard spiral and it only gets worse. Your plane is almost sideways you're just tightening the turn by pulling back on the yoke, but all you can see is that altimeter going lower, lower, lower. The engine is into the red and growling and the airspeed is dangerously high. The sound of the air passing by begins to resemble a scream. You now have 45 seconds to live. Now you're sweating and shaking. There must be something wrong with the controls; pulling back only moves the airspeed indicator further into the red. It's supposed to do the opposite! You can hear the wind tearing at the aircraft. Rivets are popping as the load on the wings and tail far exceeds design specifications. 1800, 1500, 1100 feet...... down you go. You now have 10 seconds to live. Suddenly you see the ground. The trees rush up at you. You can now see the horizon if you turn your head far enough but it's at a weird angle -- you're almost inverted! You open your mouth to scream but. . . . . . Your time is up! UNUSUAL ATTITUDE PREVENTION: LEVEL THE WINGS, CHECK THE AIRSPEED, CHECK THE ALTITUDE, AND PUT THE NOSE ON THE HORIZON! REDUCE THE LOAD ON YOUR WINGS: LEVEL THE WINGS! 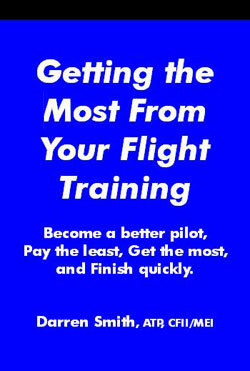 GET YOUR EYES OFF OF THE ALTIMETER AND LOOK AT YOUR ATTITUDE INDICATOR AND TURN COORDINATOR. THEN LEVEL THE WINGS! "You won't spend much more than 10% of your time flying IMC but flying IFR is about flying with precision at all times."